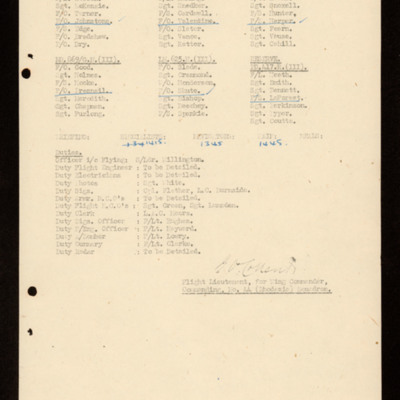 Lists crews and aircraft for operations on night 4/5 October 1944. Fourth member of each crew is underlined and some ticked. 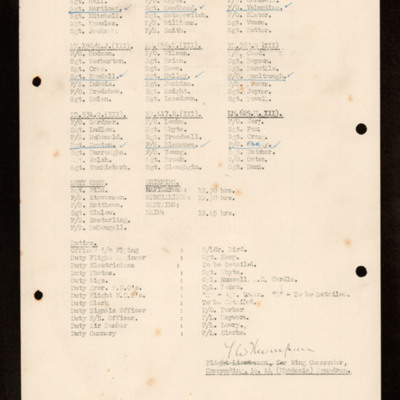 Included briefing times and duty personnel. Annotated 'Bombing Leader' at the top. 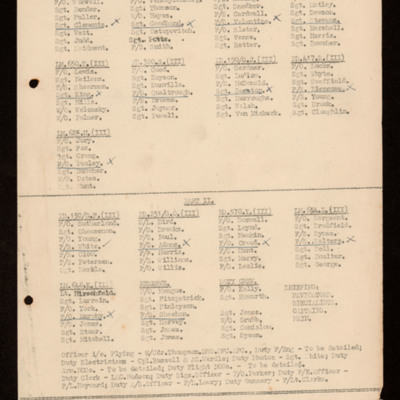 Lists crews and aircraft for operations on night 6/7 October 1944. Fourth member of each crew is underlined and ticked. 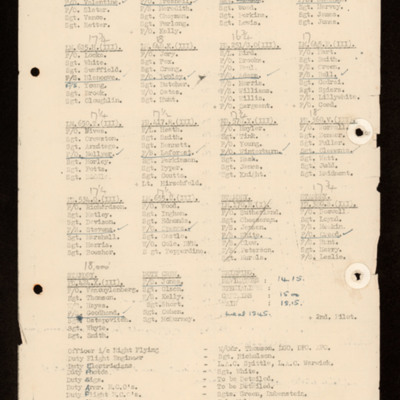 Number are annotated by each crew. Included standby crew and duty personnel. 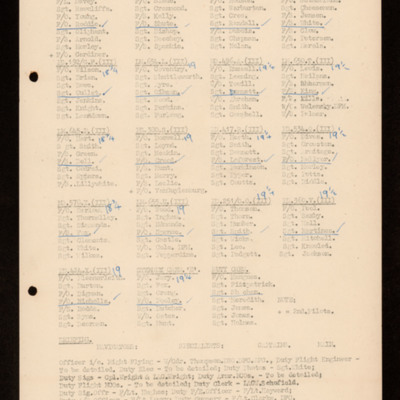 Lists crews and aircraft for operations on 17 October 1944. On the reverse a weight calculation. 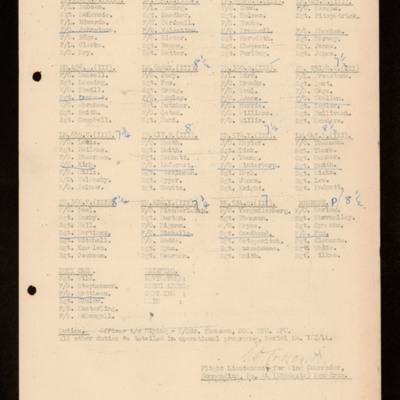 Lists crews and aircraft for operations on night 21/22 October 1944. Fourth member of each crew is underlined and ticked. Includes two standby crews and duty personnel. 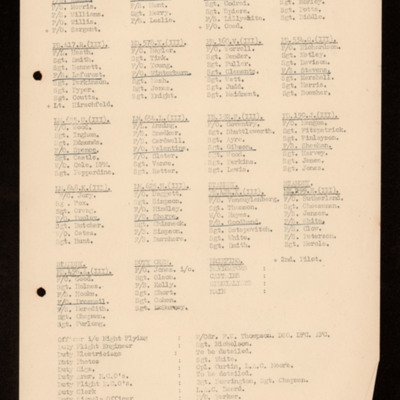 Lists crews and aircraft for operations on night 18/19 October 1944. Fourth member of each crew is underlined. Included three standby crews, duty personnel and briefing times. 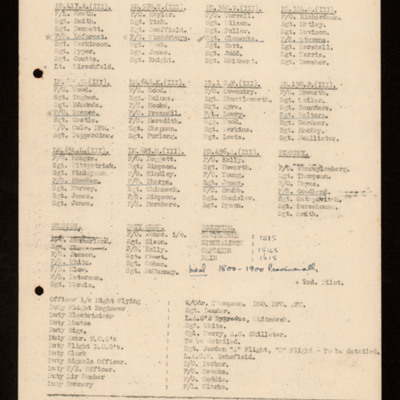 Lists crews and aircraft for operations on night 14/15 October 1944. Includes two standby crews and duty personnel. Fourth member of each crew is underlined. Briefing time annotated and weight calculation at the bottom left. 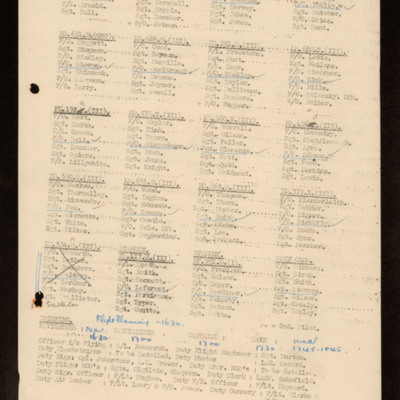 Lists crews and aircraft for operations on night 13/14 October 1944. Fourth member of each crew is underlined. Included three standby crews as well as duty personnel.Three crews are flying with a second pilot. 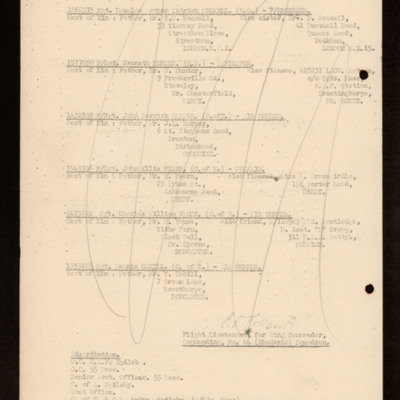 Lists crews and aircraft for operations on night 12/13 October 1944. Fourth member of each crew is underlined and ticked. Includes two standby crews as well as duty personnel and briefing times. 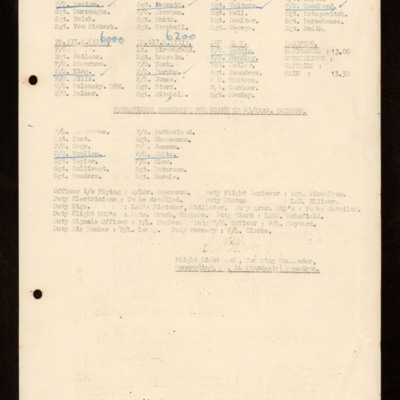 Part 1 lists eight crews and aircraft for operations on 11 October 1944. 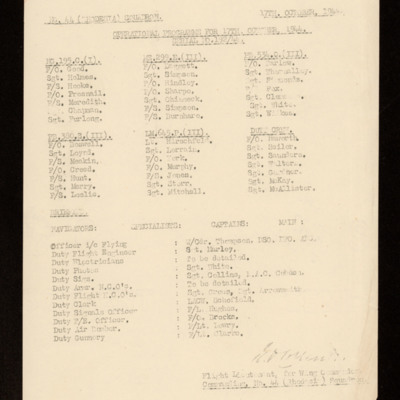 Part 2 lists five crews and aircraft as well as a reserve crew. 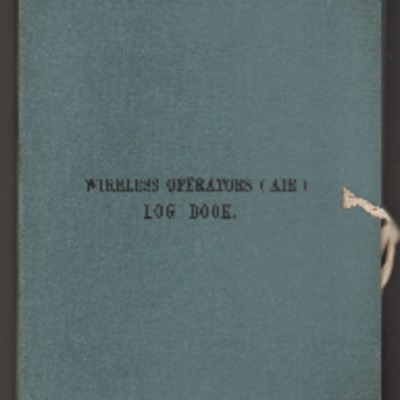 Includes duty personnel and actions if there were no operations. 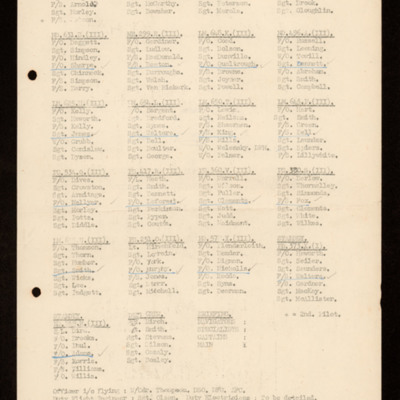 Lists six crews and aircraft for operations on 23 October 1944. Fourth member of each crew is underlines and ticked. Heights are annotated to each aircraft. At the bottom programme for night 23/24 lists two crews but no aircraft. 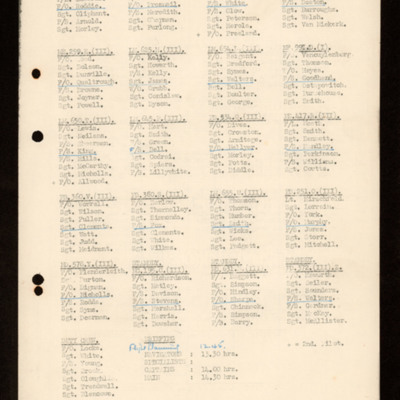 Lists four crews and aircraft for operations on night 24/25 October 1944. Fourth member of each crew is underlined. 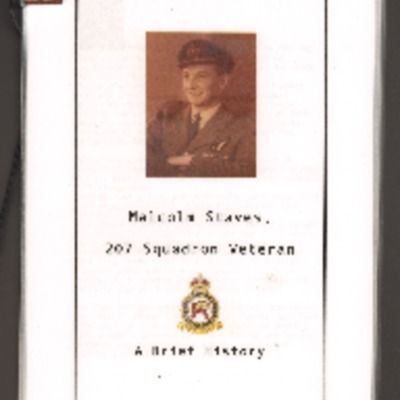 Includes briefing times and duty personnel. 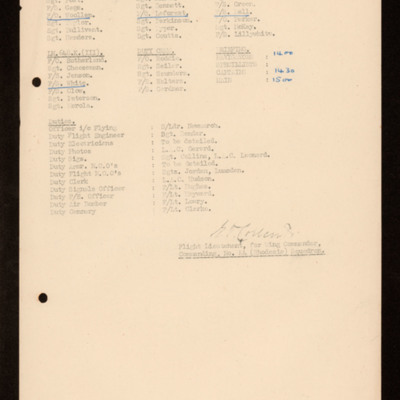 Lists crews and aircraft for operations on night 28/29 October 1944. Fourth member of each crew is underlined in blue and ticked. Includes two standby crews, briefing times and duty personnel. On the reverse a blank airman's clearance certificate.